Are you ready for the new season of Shameless? Showtime just announced season nine will premiere this September alongside the debut of Kidding. A comedy, Kidding stars Jim Carrey as “Jeff, aka Mr. Pickles, an icon of children’s television and a beacon of kindness and wisdom to America’s impressionable young minds and the parents who grew up with him. But when this beloved personality’s family begins to implode, Jeff finds no fairytale, fable or puppet will guide him through this crisis, which advances faster than his means to cope.” The cast also includes Frank Langella, Catherine Keener, and Judy Greer. Season nine of Shameless premieres on Showtime on September 9th at 9 p.m. ET/PT, followed by the series debut of Kidding at 10 p.m. ET/PT. LOS ANGELES – June 7, 2018 – SHOWTIME has announced its new fall comedy line-up with the ninth season of its hit series SHAMELESS, starring Oscar(R) nominee and Emmy(R) and SAG Award(R) winner William H. Macy and Golden Globe(R) nominee Emmy Rossum, premiering on Sunday, September 9 at 9 p.m. ET/PT, followed by the series premiere of the new half-hour comedy series KIDDING, starring Golden Globe(R) winner Jim Carrey in his first series regular role in more than two decades and reuniting him with Oscar winner Michel Gondry (Eternal Sunshine of the Spotless Mind), at 10 p.m. ET/PT. 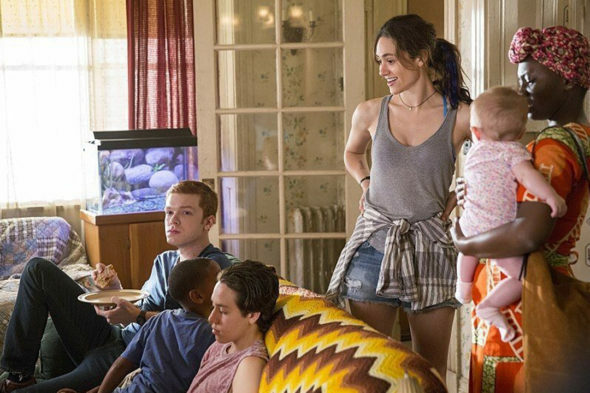 SHAMELESS season nine will feature the show’s 100th episode in week four, and is currently in production in Los Angeles. One of the network’s longest-running and most successful series ever, SHAMELESS ranks as the network’s No. 1 comedy and attracts the youngest-skewing audience of any SHOWTIME series. The season eight premiere last fall was up 50 percent versus the season seven premiere. In season nine of SHAMELESS, political fervor hits the South Side and the Gallaghers take justice into their own hands. Frank (Macy) sees financial opportunity in campaigning and decides to give voice to the underrepresented South Side working man. Fiona (Rossum) tries to build on her success with her apartment building and takes an expensive gamble hoping to catapult herself into the upper echelon. Lip (Jeremy Allen White) distracts himself from the challenges of sobriety by taking in Eddie’s niece, Xan (Scarlet Spencer) Ian (Cameron Monaghan) faces the consequences of his crimes as the Gay Jesus movement takes a destructive turn. Debbie (Emma Kenney) fights for equal pay and combats harassment; and her efforts lead her to an unexpected realization. Carl (Ethan Cutkosky) sets his sights on West Point and prepares himself for cadet life. Liam (Christian Isaiah) must develop a new skillset to survive outside of his cushy private school walls. Kevin (Steve Howey) and V (Shanola Hampton) V juggle the demands of raising the twins with running the Alibi as they attempt to transform the bar into a socially conscious business. SHAMELESS stars William H. Macy, Emmy Rossum, Jeremy Allen White, Ethan Cutkosky, Shanola Hampton, Steve Howey, Emma Kenney, Cameron Monaghan, Richard Flood and Christian Isaiah. Created by Paul Abbott, SHAMELESS is produced by Bonanza Productions in association with John Wells Productions and Warner Bros. Television. Developed for American television by John Wells, the series is executive produced by Wells and Nancy M. Pimental. KIDDING centers on Jeff, aka Mr. Pickles (Carrey), an icon of children’s television and a beacon of kindness and wisdom to America’s impressionable young minds and the parents who grew up with him. But when this beloved personality’s family begins to implode, Jeff finds no fairytale, fable or puppet will guide him through this crisis, which advances faster than his means to cope. The result: A kind man in a cruel world faces a slow leak of sanity as hilarious as it is heartbreaking. The series also stars Oscar(R), Emmy(R) and Golden Globe nominee Frank Langella (Frost/Nixon), Oscar, Emmy and Golden Globe nominee Catherine Keener (Get Out) and Judy Greer (Married). Throughout the season, Jeff begins to push back against the limits of the well-oiled machine that is “Mr. Pickles’ Puppet Time,” and of his executive producer, Seb (Langella). Seb fears Jeff’s mental state could ruin the branding empire they’ve built, and thus begins preparing the show for a life after Jeff, while Deirdre (Keener), the head puppet maker, grapples with her own personal and professional life issues. Greer stars as Jeff’s estranged wife and their son is played by Cole Allen. Guest stars include Justin Kirk (WEEDS) and Ginger Gonzaga (I’M DYING UP HERE). What do you think? Do you watch Shameless? Will you check out Kidding? More about: Kidding, Kidding: canceled or renewed?, Shameless, Shameless: canceled or renewed?, Showtime TV shows: canceled or renewed? Kidding: Is the Showtime TV Series Cancelled or Renewed for Season Two?